The history of the Israeli people is rich, dramatic, tragic and fascinating. Not only does it make for scintillating study, but it seems ideal as the subject for board games. Sadly, most of the few attempts made at producing a board game using this theme have been an attempt to appeal to a religious-minded market, which is not in itself a bad thing. However, the games have generally been woeful. Fortunately, Kingdom of Solomon by designer Philip duBarry and publisher Minion Games is an exception. 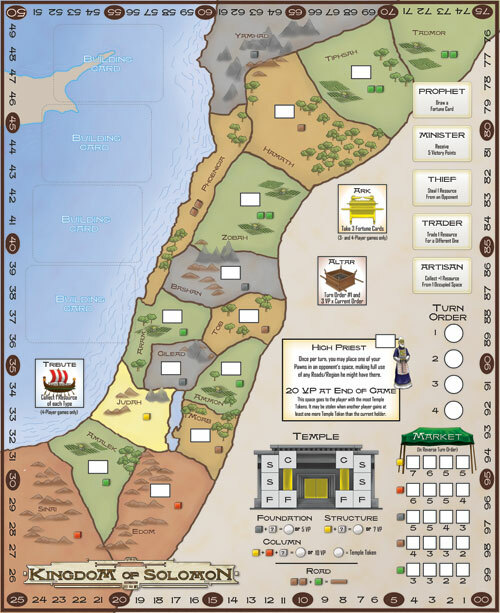 Set in Israel in the time of King Solomon, the game challenges players to collect resources, which they will use to construct various buildings, including the legendary Temple of Solomon. It is a clever worker-placement game that requires proper timing and the ability to beat your opponents to coveted locations. There is nothing startlingly new here, but everything blends together well to create a challenging and tense game. The map depicts the land controlled by the Israelis during the period of Solomon. There are sixteen territories, each producing one or two of the five different types of resources – food, timber, stone, copper and gold. Eleven of these territories have locations where buildings can be constructed. Buildings allow players to claim a particular territory and construct valuable road networks. The board also depicts numerous other features, including the market, temple, space for four building cards, and action and bonus spaces. In spite of the abundance of territories and charts, the board is uncluttered and easy to understand. Placement. Players alternate placing their pawns into the territories, action and bonus spaces. Each player has a limited number of pawns – five or six, depending upon the number of players – and it is impossible to perform all of the actions one desires. Placement rules seem easy: only one pawn may occupy any territory or action space. Further, if a territory has a building, only the owner of that building may place there. Finally, to claim one of the valuable bonus spaces, the player must use ALL of his remaining pawns. How badly do you want to perform that action? There is an exception to these placement rules: the player currently serving as high priest can place into a territory containing an opponent’s building. The “one pawn per territory” rule still cannot be violated. This phase generates considerable tension, as players often scoop spaces their opponents covet … and vice versa. Deciding when and where to place can be tough, causing tense butterflies as one anticipates a future placement, hoping that an opponent won’t grab the coveted space first. This placement tension is one of the best aspects of the game. Resolution. In turn order, players receive the resources and benefits from the territories, action and bonus spaces where they have placed their pawns. Territories yield resources, while the action and bonus spaces grant a variety of benefits, including the drawing of Fortune cards, victory points, additional resources, etc. The bonus spaces are particularly valuable. The Ark grants three Fortune cards, Tribute allows the player to take one of each resource, and the Altar gives the player an abundance of victory points and moves him to first in the turn order. However, as mentioned, a player must commit ALL of his remaining pawns to claim one of these spaces. Deciding when to claim one of these spaces can be tough. It is important to note that there is a limited supply of each resource. It is possible for this stockpile to deplete –particularly late in the game – leaving the player(s) late in the turn order unable to acquire some of the resources to which they are entitled. This can be devastating to a player’s plans, so players must keep a careful eye on the resource supply and plan accordingly. It is also important to note the importance and value of the Fortune cards. These cards generally grant players additional resources and/or victory points. They are well worth acquiring and can often grant the player the required resources to construct a building. They also add a tiny bit of atmosphere to the proceedings due to the flavor text. Sadly, this text is very sparse, and there really isn’t much history or facts contained therein. I would have preferred a bit more historical information, which would have enhanced the thin theme. Market. In reverse turn order, players alternate buying or selling at the market. The market can hold four of each type of resource, but is initially empty. The prices are indicated on the market, and range from 2 – 7, depending upon the resource. It is important to note that currency is the same as victory points, so selling excess resources can prove quite lucrative. If a player declines to buy or sell, he is out for the round. So, sometimes it is wise to buy or sell just to keep your options open and take advantage of emerging market opportunities. It takes awhile to understand and appreciate the potential power of the market. Building. 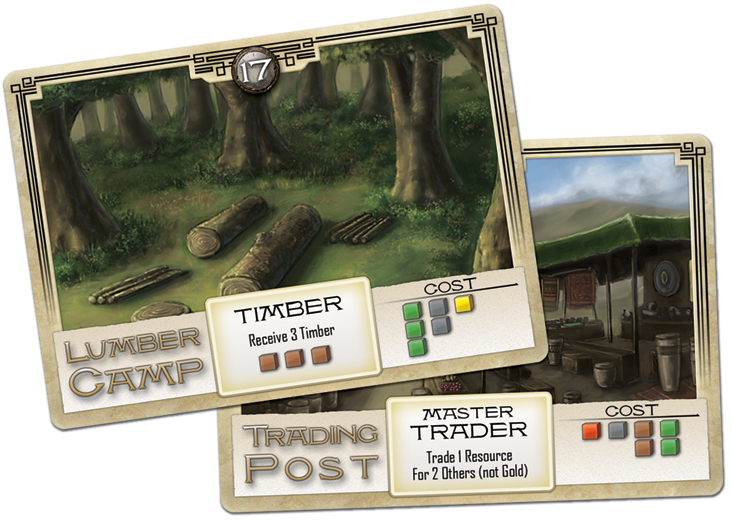 Each turn, four buildings cards are displayed and available to be constructed. Each lists the resources required for construction and the on-going benefits once it is built, which includes victory points earned. In turn order, players may construct one building, paying the required costs and placing the building card in front of them. Most buildings allow the player to also place a building marker into a territory that doesn’t already contain a building. As mentioned, this gives ownership of that territory to the player. More on this in a bit. On future turns, the player may gain the benefits of a building card he owns by placing a pawn onto the card during the placement phase. So, buildings not only give the player victory points, but also provide more placement options. In addition to buildings, players may also help construct Solomon’s Temple. The temple is constructed in three stages, the cost being a bit different for each stage. For example, the foundation is constructed first, and requires a player to contribute a stone and another random resource in order to add a block. When constructing the structure, gold and another resource are required. The final columns require gold, copper and an additional resource. When adding a block, the player can decide to take victory points (ranging from 5 – 10) or a temple token. 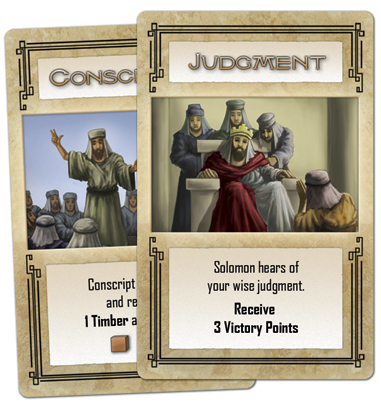 The player with the most temple tokens becomes the High Priest, a powerful position. The high priest can place a pawn in a territory controlled by an opponent. Further, the player holding the position at game’s end will receive twenty victory points. Finally, a player may construct roads. A road must originate in a territory containing a player’s building and connect to an adjacent territory that either (a) contains no building site, or (b) contains another of the player’s buildings. Roads help form regions, which allow the player to place a pawn into any one of the territories in the region and collect the resources from ALL of the territories within that region. This sounds simple, yet in practice it can get quite confusing, especially when multiple players connect common territories. There is a lengthy discussion thread on the Boardgame Geek website concerning roads and regions, and both the publisher and designer have been very helpful answering personal e-mails in an effort to dispel the confusion. Still, the rules could have been clearer on this issue, as it will likely prove to be a stumbling block for many players. Forming regions is quite powerful, as it yields multiple resources from the placement of only one pawn. Beware that pesky High Priest, though, as he too can enjoy the advantages of that network. At the conclusion of that round, players tally additional victory points for Fortune cards and being the High Priest. The winner, of course, is the player with the most points. Kingdom of Solomon doesn’t break much new ground within the worker-placement genre. For the most part, what is here has been done before in other games. Still, it does combine the various mechanisms and elements quite well and in an underutilized setting. There is a palpable tenseness to the proceedings, particularly during the placement phase. A player has so much he wants to accomplish on his turn, yet waiting too long to secure a coveted location could well cause that space to be claimed by an opponent. Yet, unlike in other games, losing a coveted space is rarely disastrous. There are other viable options. It is how well a player performs with those options that will likely spell the difference between victory and defeat. There are a few flaws and hiccups. The rulebook is ambiguous on several points, most particularly roads and regions. The phase in which roads are constructed is never mentioned, although logic tells one it should be during the building phase. As mentioned earlier, the concept of regions is vague. A better explanation coupled with clear examples would have helped. I also wish more had been done to inject the rich history of Israel. The flavor text on the cards does little to help evoke the theme or atmosphere. Still, the game is good … quite good. I have always enjoyed games that cause those nervous butterflies to flutter in my stomach. Usually this is caused by forcing me to make tough decisions … and make them before my opponents’ actions prevent me from bringing my plans to fruition. Kingdom of Solomon certainly tickles those butterflies, creating a tense and challenging experience. Further, it accomplishes this in a relatively quick 1 – 1 ½ hour time frame, so the game does not overstay its welcome. There seems to be multiple viable paths players can pursue in their quest for dominance, which should help keep the game fresh for quite some time. In the continuing avalanche of new releases, that is no small feat. Andrea “Liga” Ligabue: I was lucky enough to get a copy of this small game and it was a good catch because Kingdom of Solomon looks like a real interesting game. I still have to explore all the possibilities, but my first impression is positive. Kingdom of Solomon is a worker placement game with some interesting new twists. I really like the roads and regions mechanic and the idea that building connections could help you in gaining resources but also could offer other players the possibility to access “your resources”. Connecting a space with your building with a resource region could give, of course, you the security of accessing the resources but also offer other players the opportunity to get the resources under your building. Kingdom of Solomon works well also as a 2-players game and that is good: it is indeed much more tactical than with 3 o 4 players game. The building cards seems to be quite balanced. It is a title I’m sure I’ll continue to play since it is light but not superficial, short but not too much quick and work well. As Greg says nothing really innovative but a good mix with a nice theme and setting. I like it! This entry was posted in Reviews and tagged Israel, Kingdom of Solomon, Minion Games, Philip duBarry, worker placement. Bookmark the permalink.